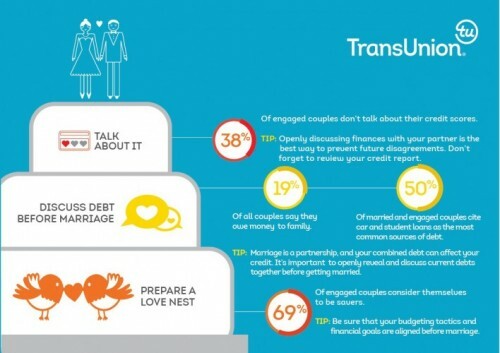 As wedding bells begin to toll this summer, a new survey from TransUnion reveals a lack of marital bliss when it comes to couples’ division of financial responsibilities. While married and engaged couples say they have intentions of making budgeting and financial decisions equally, roles changed once married. According to the survey, 51 percent of engaged couples said they intend to equally share financial decisions, but only 37 percent of married respondents said they actually share the responsibility equally. More than one in three respondents (36 percent) said they make budgeting decisions by themselves. In fact, just a quarter (25 percent) of engaged couples would check their fiancé’s credit score before matrimony, according to the national survey of 1,000 U.S. consumers engaged to be married in the next 12 months or who have already been married for up to two years. And while 85 percent of all respondents said they know where to look up a credit score, more than a quarter (27 percent) of married respondents and nearly a third (30 percent) of engaged respondents said they do not monitor their credit scores. “Credit scores are affected by a variety of factors, and can change often. So it’s important that couples regularly check each of their credit reports, especially as they plan big life events like weddings and buying a first home,” said Chaplin. Despite the confusion about financial responsibilities, most (85 percent) married and engaged couples are either extremely comfortable or very comfortable discussing money. In fact, 81 percent of married couples and 76 percent of engaged couples said their financial goals are completely aligned or mostly aligned, with saving being a large component of their combined financial plan. While saving is the largest component of couples’ financial plans for the future, married and engaged couples still struggle with debt. Half of respondents (50 percent) cited car payments as a source of debt. Student loans were the second-most-common source for engaged (35 percent) and married couples (41 percent). Discuss debt before marriage. Marriage is a partnership, and your combined debt can affect your credit. About a fifth (19 percent) of all respondents say they owe money to family. And as stated earlier, half (50 percent) of married and engaged respondents cite car payments as a source of debt, with student loans cited as the second-most-common source of debt for engaged and married respondents (35 percent and 41 percent, respectively). It’s important to openly reveal and discuss current debts together before getting married. Talk about it. More than one in three (38 percent) engaged couples don’t talk about their credit ratings. Openly discussing finances with your partner is the best way to prevent future disagreements. And you can’t forget to review your credit reports with one another. Prepare to build a love nest. The majority (69 percent) of engaged respondents, in particular, consider themselves to be savers. So it’s important to ensure your budgeting tactics and financial goals are aligned before marriage. The online survey includes responses from 1,049 U.S. consumers engaged to be married in the next 12 months or who have already been married for up to two years. The survey was conducted between May 2 and May 4, 2015.